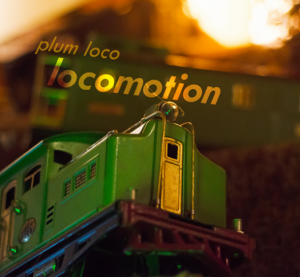 The cover of Plum Loco’s latest EP, “Locomotion”. Cover design by Audrey Lee. For many students at HHS, music is a large part of their lives. Whether it comes in the form of playing in one of the many school bands, learning an instrument on their own, or blasting rap music in the Pit, most students appreciate music. However, for some students music becomes one of their true passions, and they go above and beyond in their pursuit of it. It is students like this that make up Plum Loco, a band that is made up of both former and current HHS students. I sat down with Sam Beliveau, the drummer and writer of the second song on their latest EP (extended play), Locomotion, to talk about the band. When creating this EP, they planned for it to be part one of a two-part series, with one lighter, more folky EP, and another heavier EP. However, recording is expensive, and as high schoolers they could only afford to record one of the two, so they went with the lighter EP. Locomotion is designed to build from a calm ballad in the beginning to a noisy, chaotic ending and it achieves this well, with the climax at the end of “Flower Friend” being a definite highlight. While writing this EP they found inspiration in many places, from Wilco and Radiohead to Jazz and Funk, but the songs all blend these inspirations together incredibly well, creating a final product that is incredibly original. I also asked Sam if he had any advice for aspiring musicians, and he told me that the best thing is just to get started. You can find almost anything you would need to record and master any music on GarageBand, so as long as you have the passion for it there is nothing standing between you and making original music. Plum Loco is currently made up of HHS students Audrey Lee (‘19) at rhythm guitar and vocals, Sam Beliveau (‘18) at drums and songwriting help, and HHS alum Noah Taylor (‘17) at lead guitar and vocals as well as their friend Daniel Fitzgibbons (who did not attend HHS) at bass and vocals. The music from Locomotion can be found alongside their other work on Soundcloud, Spotify, and iTunes under “Plum Loco”. Their music was recently featured on the radio station WTPL 107.7 The Pulse. Editor’s Note: Both Sam and Audrey are friends of the editors and author of this article.